Saugus Deputy Ed Brown Dies in Gun Battle, 9-14-1924. Delusional Suspect Committed 'Suicide by Cop' and Took One With Him. 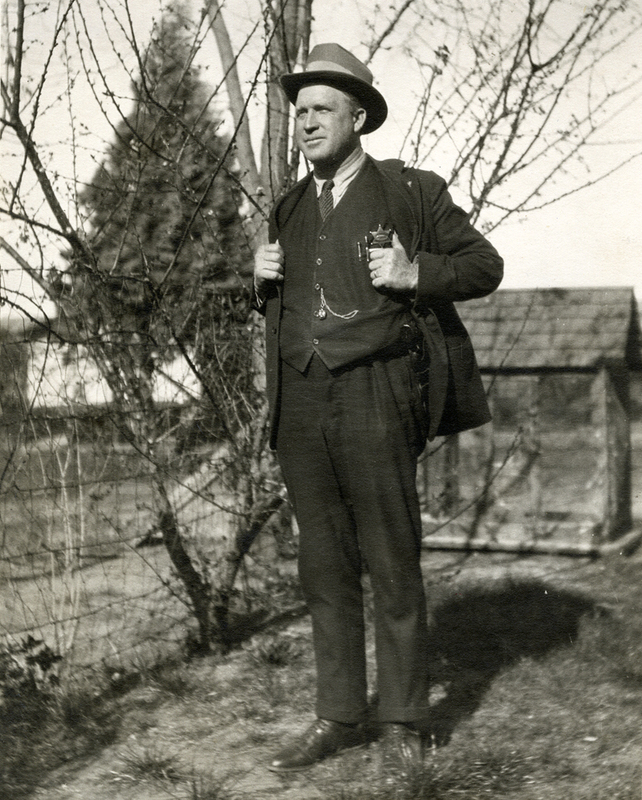 Deputy Constable Ed Brown, April 8, 1924. "Bad man" Gus Le Brun should have known he was way out of his league. But self-delusion sometimes overcomes the lovelorn. Add to that a liquor-induced temper that often spilled over into violence, coupled with a penchant for using firearms to solve his disagreements, and Gus Le Brun was a power keg just waiting for the match to be lit. The lovesick Le Brun believed the attention of the lovely Miss Nellie Bayles, better known by her stage name Bonita Darling, amounted to love rather than kindness and self-interested flirtation. Le Brun performed various tasks including fixing the water works on Darling's ranch in Tunnel Canyon outside of Newhall for the better part of a year, and the former actress appeared to take advantage of his infatuation. Le Brun believed Darling agreed to marry him in exchange for loaning her $200. This seemed an odd motivation for an engagement, but this was lost on Le Brun. Not only did Darling disavow any such engagement, but she told him she did not want to see him any longer. Thus the match was struck. 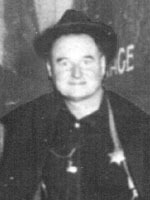 Sadly, Le Brun's subsequent explosion resulted in a gun battle that took the life of popular Deputy Constable John Edward "Ed" Brown, as well as his own. Matters between Miss Darling and Mr. Le Brun came to a head a couple days before the fatal shooting of Sunday, Sept. 14, 1924. Darling went to Justice of the Peace P. C Miller to seek relief when Le Brun became violent. On Friday, the day before the tragic events began to unfold, Le Brun appeared before Justice Miller on a charge of disturbing the peace. He told the judge that Darling owed him money. To assuage Le Brun's claim, Darling wrote out a note for $150. Justice Miller issued an order that Le Brun stay away from Darling's property. This order and his former supposed fiancée's attempt to buy him off with a promissory note only enraged him further. 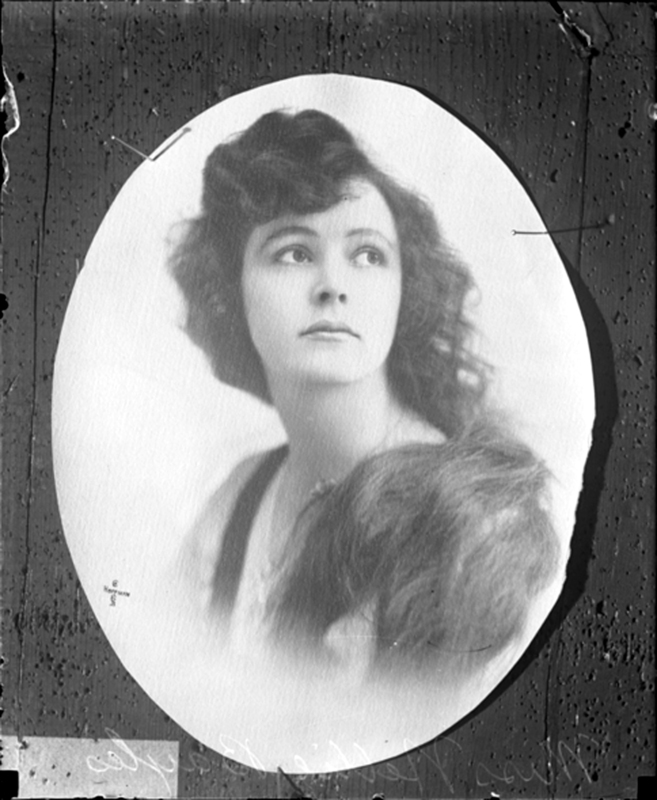 Actress Bonita Darling, aka Nellie Bayles — the object of Gus Le Brun's misplaced affection. Le Brun is buried in the Ruiz Cemetery. The next evening, Le Brun arrived at Darling's ranch in an agitated state and told her he was there to kill her. Darling, no doubt using some of the talents she had employed in her starring role in the 1915 silent movie "The Yankee Girl," informed him she had not eaten in 12 hours and needed to get food. She tried to send Le Brun away to get bread. This failed. She then managed to persuade the man to permit her to go for the bread, promising to return. Despite his agitated state, Le Brun consented to let her go, but warned that if she returned with any peace officers, he would kill them. Darling did not return at all that night but came back Sunday morning, hoping Le Brun was gone. Instead, she found the man seated on her porch with a rifle slung over his knees. When he caught sight of her, he hoisted the rifle to his shoulder and pointed it at her. Darling ran off and located Justice Miller. The justice summoned Newhall Constable Jack Pilcher. Pilcher was told of Le Brun's actions and was informed that he was drunk and tearing Darling's property to pieces. Pilcher went to Saugus and picked up Deputy Constable Ed Brown before driving out to Tunnel Canyon. As the lawmen approached the ranch, Le Brun was no longer on the porch. Instead, true to his word to Darling, he was laying in wait for the constables. As Pilcher's Ford lumbered slowly up the dirt road toward the ranch house, Le Brun stepped out behind it and yelled out, "Stick 'em up." According to Pilcher in his official report, "Before we had time to turn, there was a shot fired and we looked around and saw Gus Le Brun coming out of the brush, shooting at us." The first shot hit the dash between Pilcher and Brown. Pilcher stopped the car, and he and Brown got out of the passenger door and took a position in front of the vehicle. Le Brun continued to approach them, firing as he came on. The lawmen ordered him to stop shooting, then hastily began to return fire. Soon their bullets began to find their target. 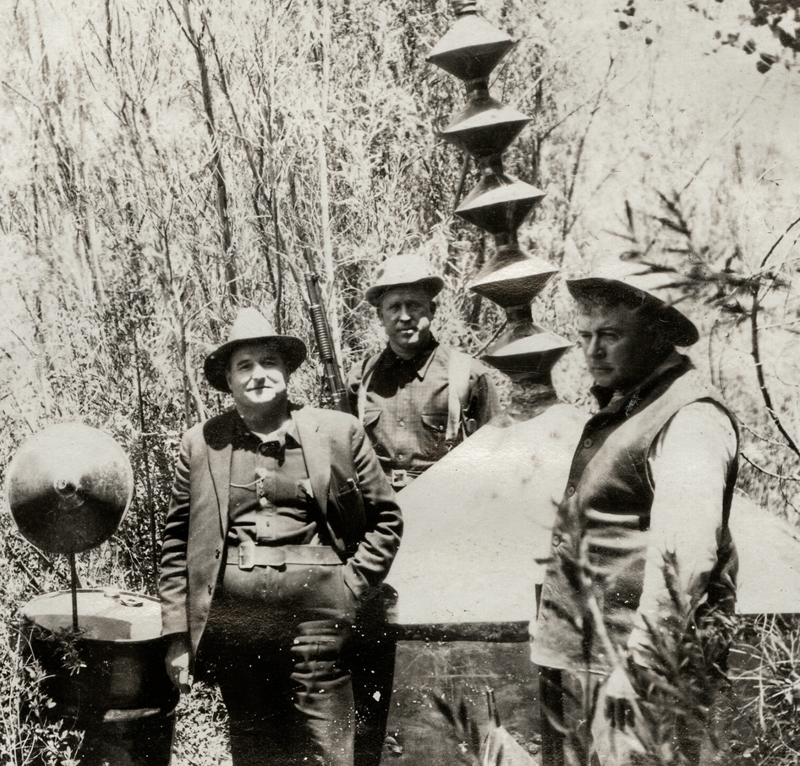 Members of Newhall's Dry Squad — Constable Jack Pilcher (left), Deputy Constable Ed Brown (center) and a third officer bust up a still in one of the local canyons during Prohibition in 1924. According to Pilcher, "We evidently hit him because he fell several times but he did not give up but would say [he] would give up and then when we stepped out he began shooting again. Finally, he threw his rifle down and said, 'I am dying.'" But this was another ruse to draw the lawmen in. As Brown and Pilcher approached Le Brun, he was in a "half-sitting" position. When they were 12 to 15 feet from the man, he withdrew a .45 revolver from under him and fired it twice. One bullet went wild, but the other passed through Brown's stomach. Pilcher fired again, striking Le Brun in the head and bringing the gunfight to an end. Despite his injury, Brown was able to put Le Brun's rifle in the car as Pilcher secured the .45 next to it. Brown then told Pilcher, "Jack, he has got me. You had better take me to the doctor first." Brown died at the Metropolitan Hospital in Los Angeles later that night. A suicide note was found on Le Brun's body. In it, he blamed Darling for spurning him even though, "I loved her with all my heart and I hated to part from her. She pretended to comply with my love, but was false. I decided my life wasn't worth living. … Bonita has kissed me, loved me. My life is a wreck, so good-by to all my dearest friends. I will now end my middle-aged life and all on account of Bonita Darling, but she will not stay on earth to give me the horse laugh again." Le Brun was unable or unwilling to fulfill this veiled threat against Darling either on Saturday night or Sunday morning. Unfortunately, Ed Brown did pay the price for Le Brun's desire for suicide. Despite Le Brun's wish to die, he was struck with eight rounds from Brown and Pilcher's weapons before the final head shot by the constable put him down. Le Brun also prepared himself for a prolonged gun battle with lawmen, as approximately 100 rounds of ammunition were found in his clothing. He may have wanted to die, but it was clear he did not want to go alone. 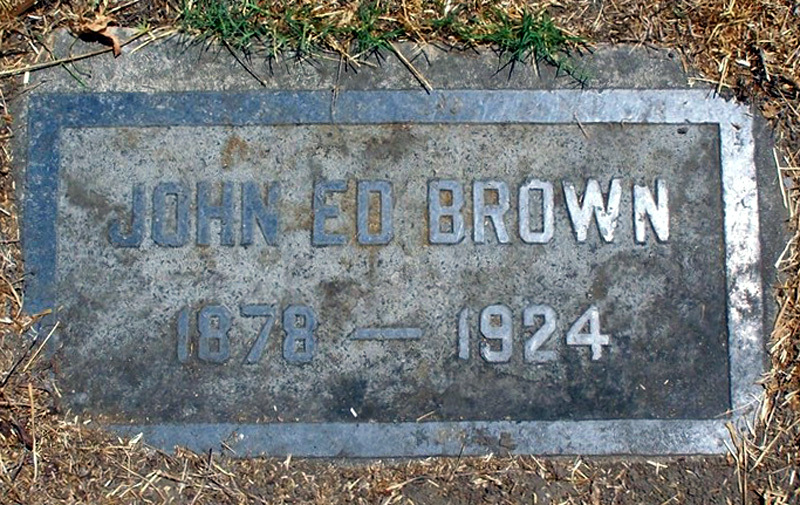 Ed Brown was 43 at the time of his death and was stationed at Saugus. He was survived by his wife, who was a nurse. Pilcher was the ranking officer, but both he and Brown were fast friends who were widely known across the Santa Clarita and San Fernando valleys. Ironically, it was reported that both men "frequently engage[ed] in heated friendly arguments over the probable risk the other was to take." Deputy Constable Ed Brown is buried at Grand View Memorial Park in Glendale. Photo courtesy of Ann Stansell. Click to enlarge. On Sept. 14, 1924, the risk they took was shared, but Brown was the one unfortunate enough to answer eternity's call. A fitting tribute was written for Brown in a local paper a few days after his death. It reads in part, "He died in the work he loved. He died as the rare officer of his type desire to go – to meet their maker in harness. Los Angeles County has lost an officer in every sense of the word. His remarkable success has been felt over the entire valley and those who know him can only say: Ed Brown was HONEST, CONGENIAL, JUST and COURAGEOUS; a lovable character." In a cruel twist of fate, Jack Pilcher would survive his friend by less than a year. On June 4, 1925, Pilcher and his new deputy constable, John Seltzer, were spending the night on a ranch in Bouquet Canyon during the course of conducting a burglary investigation in the area. Seltzer was startled awake in the middle of the night by a lizard and tried to shoot the creature. Instead, he dropped his gun and the weapon went off. The round killed Constable Pilcher. After surviving numerous gunfights with bootleggers and bandits, not to mention the shootout with Le Brun, it was a cruel and ironic way for the veteran lawman to die. Like Deputy Constable Deputy DeMoranville and Deputies Benson and Guard, Deputy Constable Brown's death was only recently discovered, and he was recognized on the state and federal peace officer memorials along with them in May 2013. Brown's name was added to the County Memorial Wall in Whittier in May 2012. 1. The Frank Le Brun family settled in San Francisquito Canyon in the late 1880s. Gus must have been a wayward son.